The US government on Wednesday ordered two senior Venezuelan diplomats to leave the country in response to the expulsion of two US officials announced a day earlier by Caracas. President Nicolás Maduro had ordered the expulsion of the senior US diplomats during his proclamation on Tuesday as president reelected by the National Electoral Council (CNE). 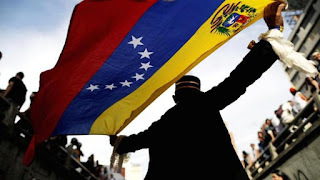 The Chargé d'Affaires of the Embassy of Venezuela in Washington, Carlos Ron, and the vice-consul in Houston were declared "persona non grata" by the US Department of State. "They have been ordered to leave the United States in the next 48 hours," spokeswoman Heather Nauert said in a statement. The measure responds to the decision of Venezuelan President Nicolás Maduro to expel the Chargé d'Affaires of the US Embassy. in Caracas, Todd Robinson, whom he accused on Tuesday of "conspiring" to overthrow his government. Maduro also announced that the head of the political section of the US diplomatic mission, Brian Naranjo, should leave Venezuela in 48 hours. "The accusations behind the decision of the Maduro regime are unjustified," the State Department said in its statement. "Our embassy officials have carried out their official duties responsibly and consistently with diplomatic practice and the applicable provisions of the Vienna Convention on Diplomatic Relations, and we reject any suggestion to the contrary," the text added. The Secretary of State of the United States, Mike Pompeo, had already announced that his government would respond "reciprocally" to the expulsion of its diplomats. Therefore, ahead of the foreseeable expulsion of Carlos Ron, Maduro appointed him on Tuesday as Vice Minister of Foreign Affairs for North America and vacated, for the time being, the position of Chargé d'Affaires in Washington. Not USA nor Venezuela have an ambassador in their respective diplomatic representations in Washington and Caracas, for which the Charge d'Affaires is the highest diplomat in charge of the relations between both countries. For the United States, the presidential elections on Sunday in which Maduro was declared the winner were held fraudulently, so this Monday the country imposed new sanctions against the Venezuelan government and threatened to take further measures. Maduro said that US measures offended "national dignity." It is evident that the relations between the United States and Venezuela are experiencing one of the worst moments in recent years. The administration of President Donald Trump has hardened his stance against the Maduro government, which calls for free elections and accuses of having turned the country into a "dictatorship." For his part, the president of Venezuela accuses the United States of leading a "supremacist" government and continues to blame the United States and its allies of the economic, social and political crisis in the country he governs. The recent elections held in Venezuela were applauded by the same and criticized in the same way, by the most powerful countries of the world.